One of the sectors in which KRION®, the compact mineral from PORCELANOSA Group, is one of the most ideal materials is without a doubt the health sector. Thanks to the intrinsic characteristics that the new generation solid surfaceprovides – anti-bacterial without additives, imperceptible joins, easy cleaning, regeneration, low conductivity, resistance to chemical attacks – KRION® is a material of reference in the world of hospitals, and is the reason for our presence at HopitalExpo. 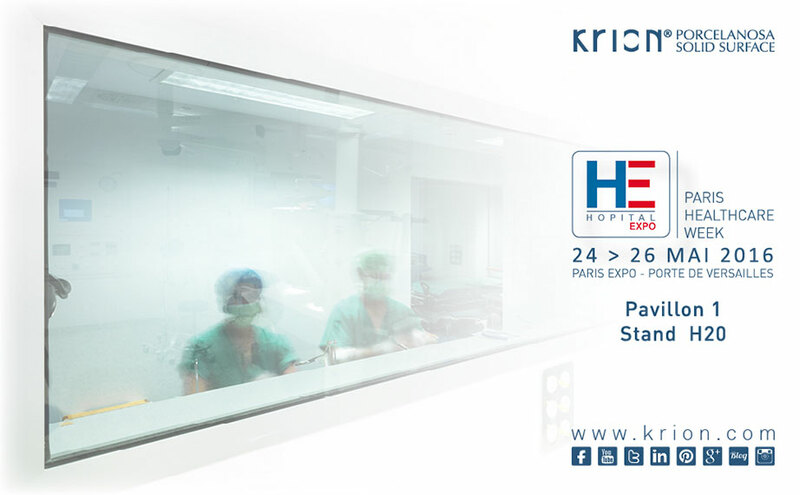 From the 24th to 26th of May we will be waiting for you in Hall 1, Stand H20 at Paris Expo – Porte de Versailles, in the French capital, where the trade fair dedicated to equipment and solutions for the management and transformation of health centres, HopitalExpo, will take place. HopitalExpo is divided into 4 sectors; Equipment (medical devices, equipment, etc. ), Reception (technical support, logistics, etc. ), Administration (Human Resources, consulting, etc. ), and Construction. PORCELANOSA Group has a lot to offer, presenting the advantages of our material KRION® at this trade fair.